Explanation: Why does the Crab Nebula flare? No one is sure. The unusual behavior, discovered over the past few years, seems only to occur in very high energy light -- gamma rays. As recently as one month ago, gamma-ray observations of the Crab Nebula by the Fermi Gamma Ray Space Telescope showed an unexpected increase in gamma-ray brightness, becoming about five times the nebula's usual gamma-ray brightness, and fading again in only a few days. Now usually the faster the variability, the smaller the region involved. This might indicate that the powerful pulsar at the center of the Crab, a compact neutron star rotating 30 times a second, is somehow involved. Specifically, speculation is centered on the changing magnetic field that surely surrounds the powerful pulsar. Rapid changes in this field might lead to waves of rapidly accelerated electrons which emit the flares, possibly in ways similar to our Sun. 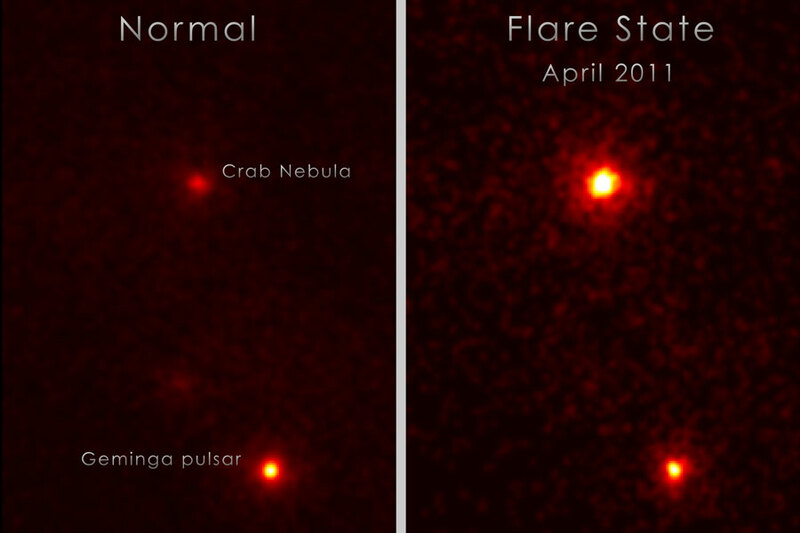 The above image shows how the Crab Nebula normally appears in gamma rays, as compared to the Geminga pulsar, and how it then appeared during the recent brightening.